I don’t know who Betty and Dave are, but I like them. And I like their new addition to Inglewood’s growing list of cute brunch spots. 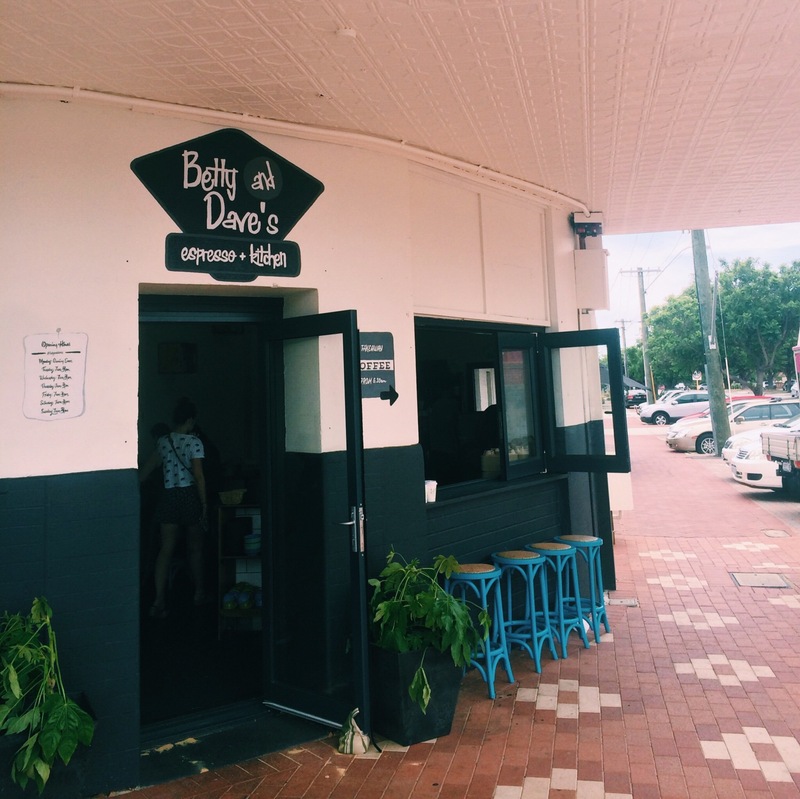 Betty & Dave’s is a bit of a retro style diner sporting colourful interiors, a healthy menu and the coolest bright pink coffee machine you ever did see. It’s a nice change to your usual minimalistic dining experiences, with colour on ever surface. 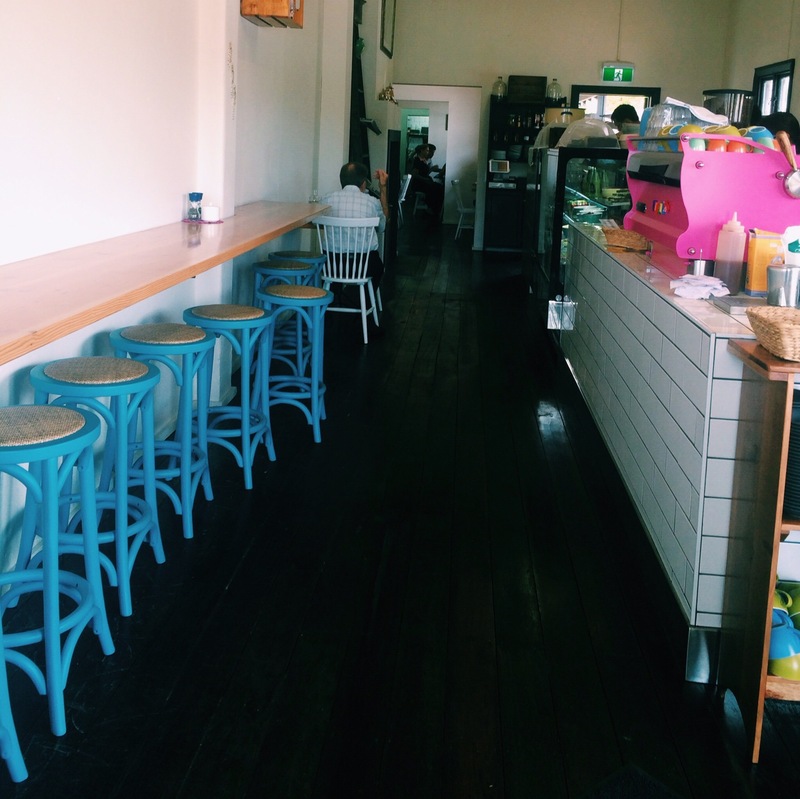 Bright blue stools work perfectly with slick wooden floors, whilst the ambience is created with old school tunes to impress even the pickiest of muso’s. There is the option to sit in, out and even in the window, with a larger dining space “out the back” away from the buzzing front area and till. On the morning E and I visited it was your typical Summer day – stinking hot at 9am. 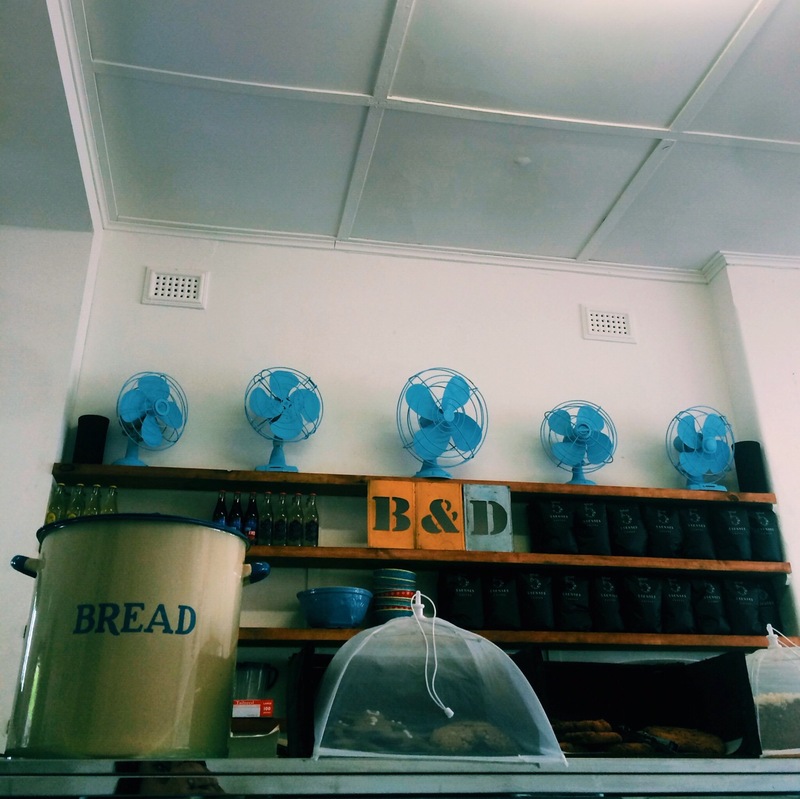 We were both melting and parched, and were happily seated under the air conditioner in the front area of the cafe. The friendly waiter brought us over some tap water and menus and informed us the cafe was table service. Nice! After scouting the menu filled with healthier options including The Summer Beans (peas, beans, pancetta and house goats curd on sour dough – $19) and the The Bircher (cinnamon and almond milk quinoa, cherry compote and chia – $15) and not so healthy options like The Jaffa Waffles (buttermilk waffles, chocolate icecream, orange and caramel – $17) both E and I ended up deciding on the same dish! This never happens and can be slightly frustrating when blogging a new place, but sometimes it happens. The dish we both chose that day was the The Rosti ($21). 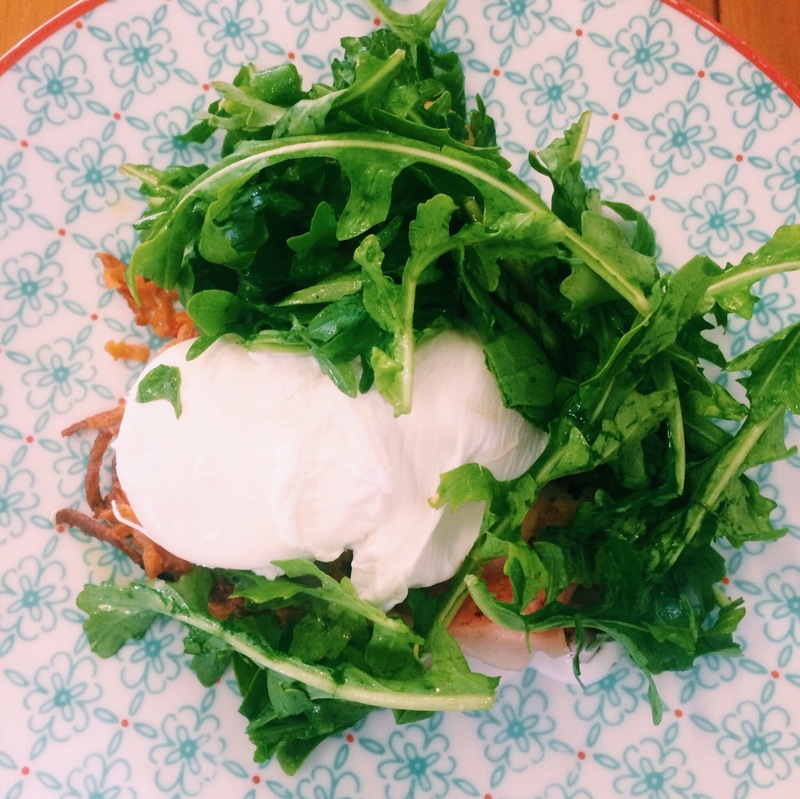 Sweet potato rosti topped with bacon, poached eggs, shaved asparagus and rocket salad and coconut yogurt. First up, coconut yoghurt on a savoury dish? I’m a huge fan of trying new food combinations but this one had me stumped. I had no idea how it’d taste, and E being E decided to take it off her order and add a side of hollandaise which they were happy to do. I’ve visited a few cafes lately who do not alter the dishes on their menus which can be a little frustrating if you’re not a fan of something! But no issues with that at Betty & Dave’s! Back to the yoghurt. I’m a huge coconut yoghurt fan so when the dish did arrive (quite promptly I must say) I dove straight in. The yoghurt was smeared on top of the crunchy, golden rosti and the combination of the two together was surprisingly very tasty! The creaminess of the yoghurt balanced beautifully with the crisp potato cake and I really liked the two ingredients together. Add in a generous serving of chargrilled bacon (not too crunchy, not to soft) and some well poached eggs and the dish was a gorgeous balance of salty, sweet and so good. I loved the addition of the asparagus and rocket but the bitterness of the rocket was a little overwhelming as I made my way through the mountain of salad. Besides that minor detail, I really enjoyed my breakfast! If you’re trying to be good this dish is paleo too, so you can save your cheat meal for something from the sweets cabinet if you like! E really enjoyed her meal, and said the hollandaise was a great addition. We all know how well poached eggs go with that sauce and crispy bacon! Yum. To the rest of the menu, Betty & Dave’s has a whole cabinet dedicated to fresh, tasty salads including one I noticed packed with soba noodles and fresh vegetables and decadent sandwiches including a pulled lamb. If you’re in the area and in a hurry you know where to go friends! Drinks wise the cafe has your usual hipster juices and fizzies, but you won’t find Coke at Betty & Dave’s! Haha. E tried a lovely Gingerella Ginger Ale instead of her usual caffeinated order. It was zesty and light and we both enjoyed it. 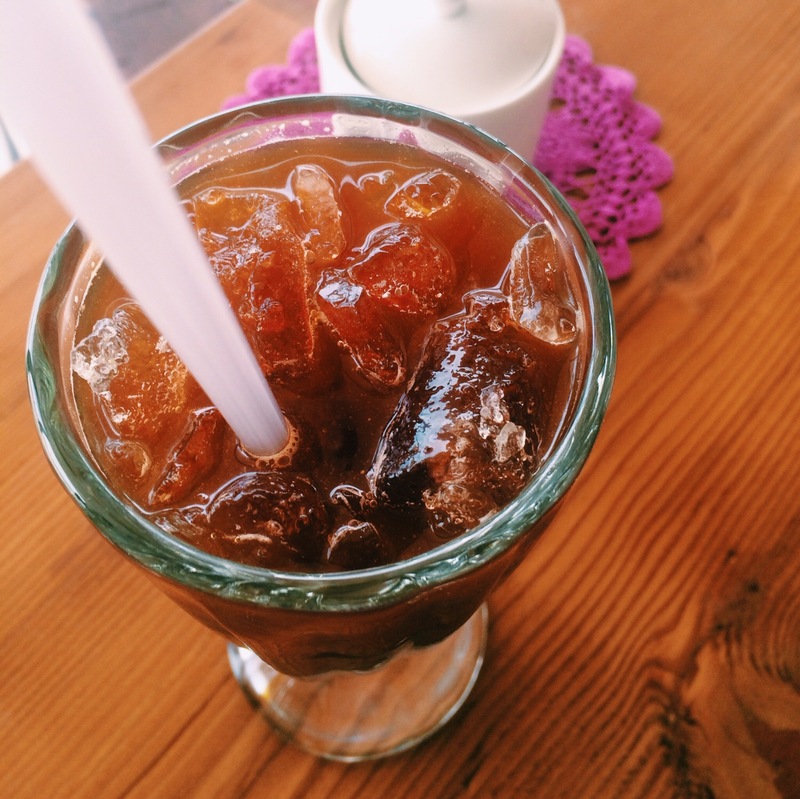 Being such a hot day I needed coffee, but opted for my new Summer coffee order of an Iced Long Black. I’ll be honest here and say it wasn’t the best ILB I’ve tried but it did the trick. I don’t think it was strong enough for my liking so next time I’ll ask for a double shot. One average coffee won’t put me off a place! 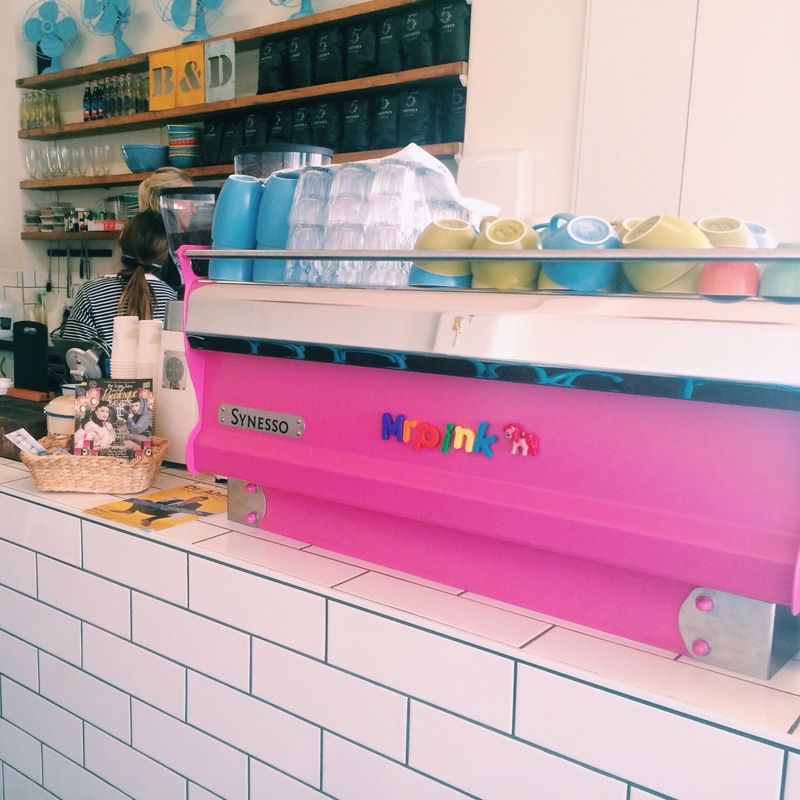 Next time I’ll be trying my usual order, especially because it’s made at that fancy pink coffee machine, haha! If you’re looking for somewhere a bit different for brunch, somewhere that’ll cater for both the sugar fiends and the health nuts this is your place. Try somewhere new this weekend, you might find your new favourite hang out! What is your Summer breakfast order? Oh yum that dish looks and sounds amazing 🙂 Glad you had such a good experience there, always a bit of uncertainty trying a new place! I love trying new places, so many winners! Love the sound of the coconut yoghurt on the rosti. Nice pics of the place too!! You should try it T! Previous PostP E R S O N A L : Cut yourself a break & those small wins.